We've found a name - Haley (Hay-Lee). 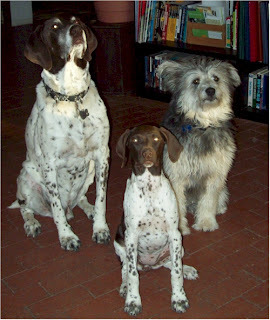 She has settled in very nicely with Stinky and Chica, and even managed to learn "Sit" in her first week. In house accidents have been kept to a minimum (3 total). We had to purchase a specially shaped bowl to slow her eating. It seems to be working so far - we've actually heard her chew a few pieces rather than just gulping! She has been teething, but there are a million toys and rawhide for that. Nothing has been inappropriately chewed, but for the occasional arm, hand, finger and John's hair. She loves balls and ANY toy with a squeaker - squeakers are the BEST!!! She had her first bath last night and, like Stinky, she pretty well hates water. Haley is an "All or Nothing" kind of girl - she's either fully alert and running about, obsessed with a squeaker toy, or dead asleep. 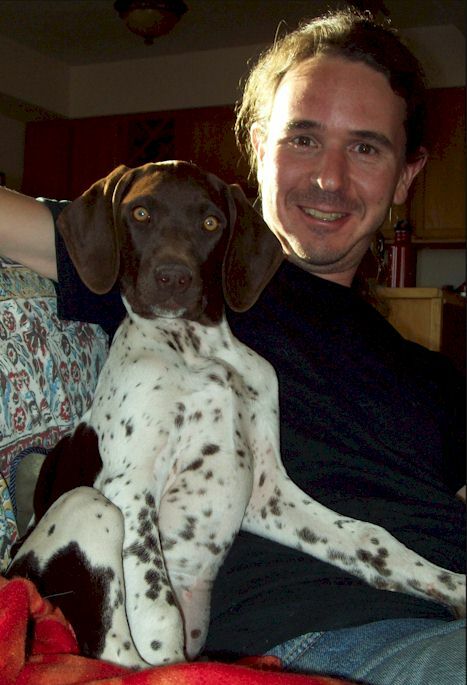 She is very fond of John (he has a way with the ladies) and is convinced the sofa is hers. Life Lines aren't just for gameshows! The prototype pictured to the right is a new pattern I'm working on for my dear friend Joann - the pattern will be named after her of course! She asked/challenged me to create a pull on turban-type cap with a cabled edge. I LOVE projects like this!!! Designing is fun, of course, but working through the challenge of fulfilling someone else's vision is problem solving at its best! In the photo you will notice two lines in the cap that have a dark line of thread running through them. These are "Life Lines"
Life Lines are very useful in both knitting and designing/prototyping. When knitting particularly complex patterns, running a life line gives you a safe point to frog back to if you discover an error. I also like to run life lines on the last row of repeats; they provide me with an easy visual mark to count my repeats against. When designing or knitting prototypes, life lines can also be used to mark pattern transitions for scaling. For this particular project, they are worth gold. The above cap appears complete, however, the reality of the matter is the fit is wrong. The overall length falls short. Because I ran a life line through the last row before closing the cap with decreases, I can unravel back to that point, add body length, throw another life line, close it and re-test the end product, making edits to my written pattern along the way. I have no risk of over frogging. Incorporating life lines has saved me a lot of hassle and guesswork. You can use them in any project. 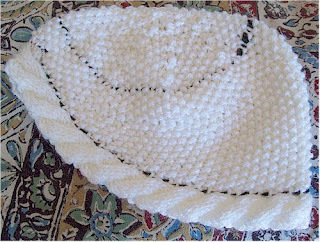 To run a life line, simply run a contrasting color of scrap yarn through stitches on the needle using a tapestry needle, as if to "hold stitches". Simply continue on with your pattern ignoring the life line. Life lines can be removed once your project is finished. Should you need to use one of your life lines, simply unravel back to the life line. You'll easily be able to reload your "held" stitches back to your needle. I've just made 4 more of the Baby Gnome Hats in Christmas colors for sale in my friend's maternity resale shop. This was the first time I've used Red Heart Shimmer and honestly, although I'm not normally attracted to sparkly or glitzy yarn, I LOVE it for these baby hats - it made them very festive! Click on the Patterns Link above to get this pattern for yourself! It wasn't entirely planned, just an incredible opportunity that fell into our laps. Here's our new little girl! 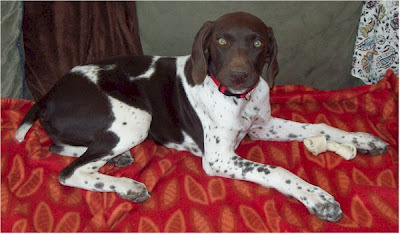 She is a purebreed German Shorthair Pointer (same as Stinky) from wonderful Field Champion stock. No, she hasn't been named yet. We've toyed with a number of names, but she hasn't agreed to anything yet. We are open to suggestions. Stinky and Chica have sniffed and decided she can stay. She's already following along nicely with the daily routine. Nature Boy (the cat) puffed up to approximately 3 times his size upon awareness, but still managed to eat his dinner before going about his way. She was interested in meeting him, but gave him space. 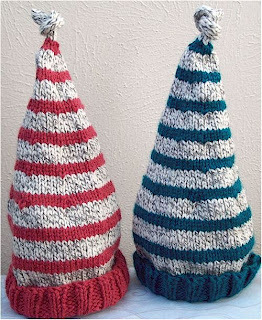 Announcing my latest pattern, "Baby Gnome". 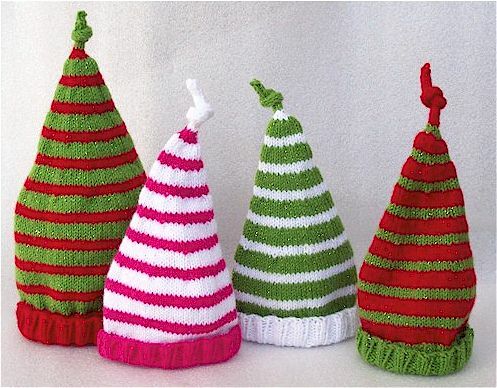 This whimsical pattern comes with instructions for four sizes; newborn, 6 months, 1 and 2 year. "Baby Gnome" has been posted to my Etsy store, MyKnits.com and Ravelry.com for sale. Both MyKnits and Ravelry provide automatic delivery / download of the PDF file upon receipt of payment. Etsy sales will receive an email containing the PDF file directly from me. If you are interested in purchasing "hard copies" please email me!